Photo by Dragons Eye/Gaea Dill-D’Ascoli. She Went to War is about real soldiers telling us real stories about their lives and service to our country. It is also the fourth Telling Project production presented at the Guthrie Theater. 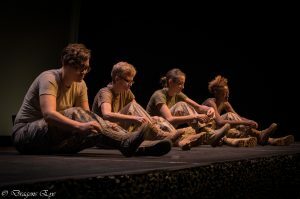 The Telling Project seeks to bridge the barriers between military and civilian groups by using personal first-hand testimonials to share the military experience with the non-military community. 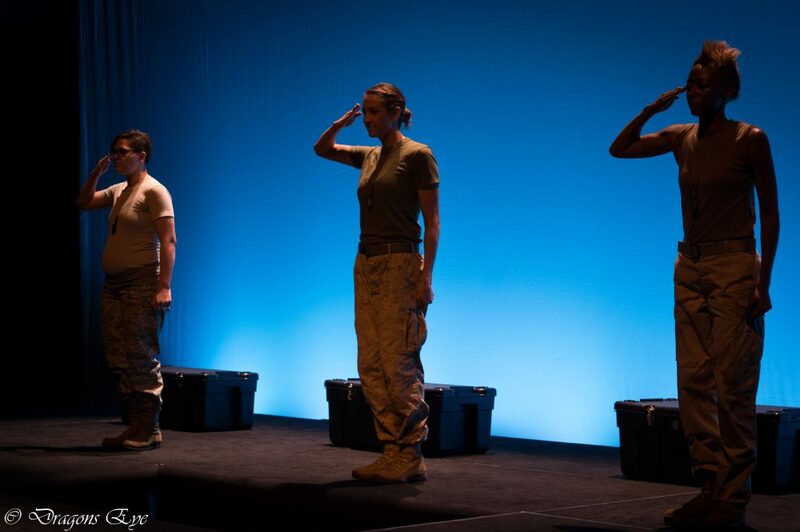 Max Rayneard and Jonathan Wei wrote and directed this recent production concerning four women military veterans. Racheal Robinson, Gretchen G. Evans, Jenn Calaway and Tabitha Nichols in She Went to War. Photo by Dragons Eye/Gaea Dill-D’Ascoli. 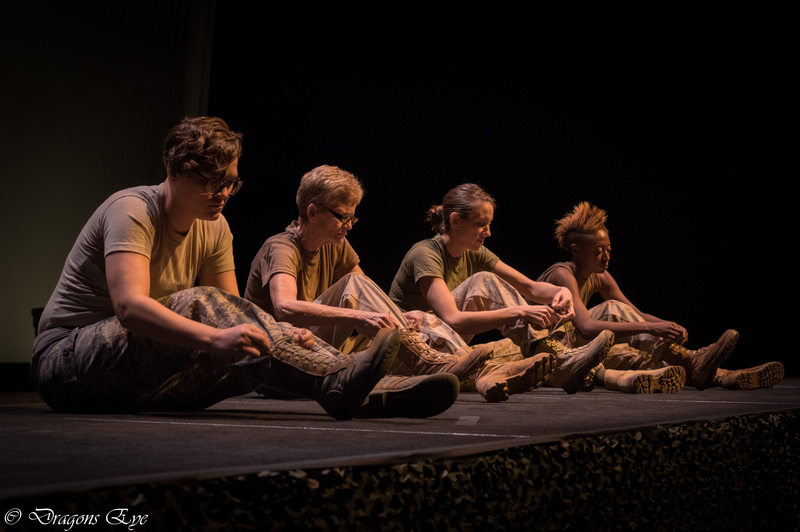 Rather than have actors assume veterans’ personas, She Went to War has four actual women veterans share their stories directly: Jenn Calaway, Gretchen Evans, Tabitha Nichols, and Racheal Robinson. Each served in the war zones of either Iraq or Afghanistan. Each saw the horrors of death up close and tells a different story as to why they joined the military. One grew up without stable housing, one joined as a solution to a personal crisis, while another joined as a patriotic response to 9/11. Each had difficulties in readjusting to civilian life. Each veteran relays their personal story of facing both courage and death. The most memorable was that of the petite 27-year-veteran Sergeant Major Evans who relates the chilling details of an ambush that forced her and her men to fight their way up a hill where they were cornered at the top. Fully expecting death, she and her surviving men were saved through the miraculous arrival of Huey helicopters sent to rescue them from the hilltop. It is a story reminiscent of the valiant struggle of soldiers fighting uphill at Hamburger Hill during the Vietnam War. These women did not serve together in the military, but their comradery on stage conveyes a mutual bond which, at least temporarily, encompassed the audience. There is nothing noble about war, but those who selflessly serve their nations in time of war will always be noble. Racheal Robinson, Jenn Calaway and Tabitha Nichols in She Went to War. Photo by Dragons Eye/Gaea Dill-D’Ascoli. She Went to War plays through April 2 at the Guthrie Theater’s Dowling Studio.